Tunisia is situated on the north coast of Africa, the northernmost country on the Continent. 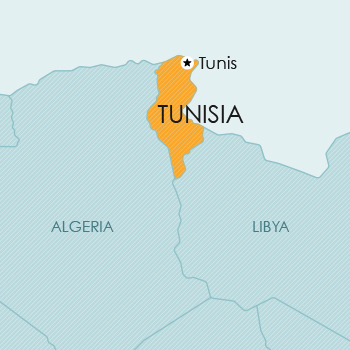 Tunisia is bounded by the Mediterranean Sea to the north and east, by Algeria to the west and by Libya to the south. The country is divided by the Atlas Mountain range: the northern area is predominantly forest and agricultural land; and the southern part is semi-arid desert. Tunisia is a member of the Paris Convention, the Madrid Agreement on Indications of Source, the Nice Agreement, the Lisbon Agreement, the Vienna Agreement, and the WTO/TRIPS. Provision is made for the registration of trade marks for goods and services, for collective marks and for well-known marks. Applications may be filed as national applications, in appropriate circumstances claiming priority in terms of the Paris Convention. Tunisia is a member of the Paris Convention, the Budapest Treaty, the PCT and the WTO/TRIPS. Patent protection is available via a national filing, in appropriate circumstances with a claim to priority, or by way of a national phase application based on an international PCT application in which Tunisia is designated. Tunisia is a member of the Paris Convention, the Hague Agreement, and the WTO/TRIPS. Design protection is available by a national filing or by way of an international filing via the Hague Agreement on the International Registration of Industrial Designs, designating Tunisia. Tunisia is a member of the Berne Convention and the WTO/TRIPS. translations and arrangements or adaptations of the above works. Copyright shall also apply to derivative marks. Tunisia is a member of the UPOV Convention. Plant breeders’ rights can be obtained in Tunisia in terms of legislation of the Tunisian Ministry of Agriculture.